Hi, everyone! 今日も元気？ ( = Kyou mo genki?) How are you doing today? Since my previous lesson was pretty grammar intensive, why don’t we just relax today and talk about food! = Nagoya no meibutsu wa kishimen desu. and 味噌煮込みうどん = misonikomi udon = Miso Noodles. = Fukuoka no tokusanhin wa, karashimentaiko desu. = Fukuoka’s local product is spicy cod roe. We live in Nagoya and we have several 名物　( = meibutsu) including above mentioned きしめん ( = kishimen) or 味噌かつ ( = Miso katsu) Pork cutlet with miso sauce. 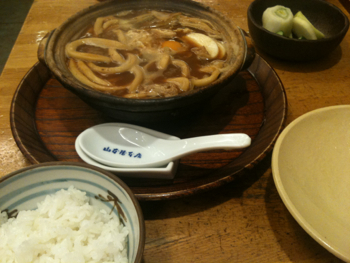 They are specifically called 名古屋めし ( = Nagoya meshi). 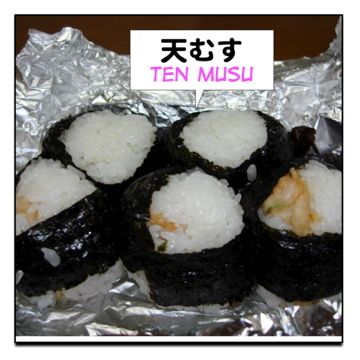 It is おむすび ( = omusubi) (It is also called おにぎり ( = onigiri)), rice ball, with 天ぷら ( = tempura)! Can you see 天ぷら(=tempura)? No? Then how about in this picture? エビ(海老)の天ぷら入り ( = ebi no tempura iri), With shrimp tempura! They are originally from 名古屋 ( = Nagoya) but you can buy them in many other places in Japan now. 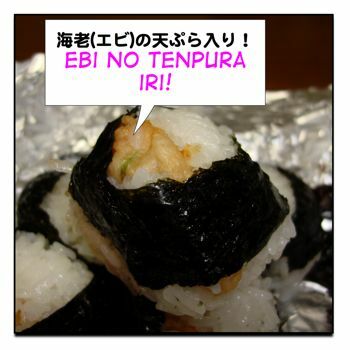 If you have ever been to Japan, you must have had おにぎり ( = onigiri) or おむすび( = omusubi) once or twice. There are so many kinds of おにぎり( = onigiri). 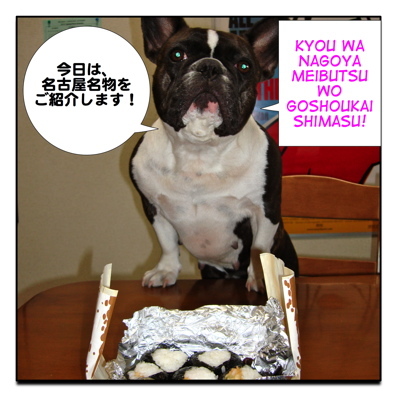 Every おにぎり ( = onigiri) has something inside which is called 具 ( = gu). 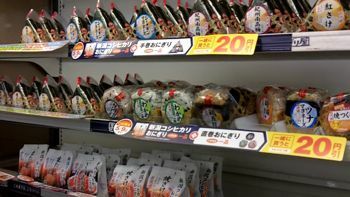 You can buy all sorts of おにぎり ( = onigiri) riceballs at a convenience store. The most traditional one is the one with 梅干し ( = umeboshi) pickled / preserved Japanese plums. !up! 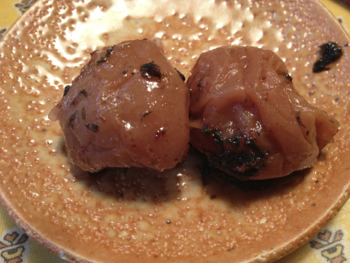 This is 梅干し(=umeboshi). If you salivate, when you see the picture, you must have tasted it before! •「梅干し大丈夫(ですか)？」( = Umeboshi daijyoubu (desuka)?). So I can guarantee（!?) that some Japanese people might ask you if you like 納豆 ( = nattou) or not while you are in Japan. But please don’t get annoyed. They could be just curious but some of them are just being overly careful not to give you anything strange. Anyway, おにぎり ( = onigiri) is a very handy meal to take out for lunch. It has been one of 母の味 ( =haha no aji) homemade cooking like mom used to make. However, nowadays, you can buy them anywhere including コンビニ ( = konbini) convenience stores. Have you ever heard or seen the word, B級グルメ ( = Bii kyuu gurume)? I don’t think it is in the dictionary yet. •グルメ ( = gurume) is a word which comes from gourmand or gourmet. = Maggie wa gurume da. = Maggie is a gourmet. = Maggie wa gurume na tabemono bakari tabeteiru. = Maggie always eats gourmet food. = TV program which introduce lots of gourmet food. = A reporter for gourmet TV shows. Note : If you watch Japanese TV all day long, I am sure you will encounter one of our many グルメ番組 ( = gurume bangumi) Many Japanese people are obsessed with food! Ex. B級映画 ( = bii kyuu eiga) Low budget indie movie. So B級グルメ( = bii kyuu gurume) is 安くて ( = yasukute), cheap, 庶民的 ( = shominteki) casual でも美味しい ( = demo oishii) but delicious, fast food! •庶民 ( = shomin) = 大衆 ( = taishuu) regular people, common people. •庶民的 ( = shominteki) casual, for regular people. = casual food for regular people. 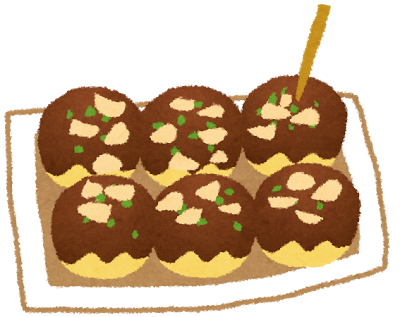 •たこ焼き ( = takoyaki) octopus balls /dumplings (蛸/タコ = tako). 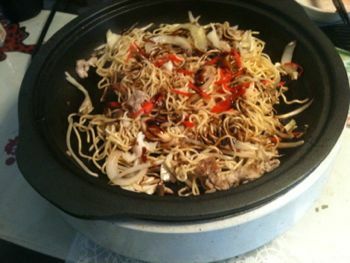 •お好み焼き ( = okonomiyaki) So called Japanese pizza. 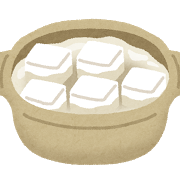 Every region has its popular B級グルメ ( = biikyuu gurume) which is called ご当地グルメ ( = gotouchi gurumet) local B-rank gourmet. It doesn’t have to be traditional Japanese food. Ex. スープカレー ( = suupu karei) Soup curry from Hokkaido! 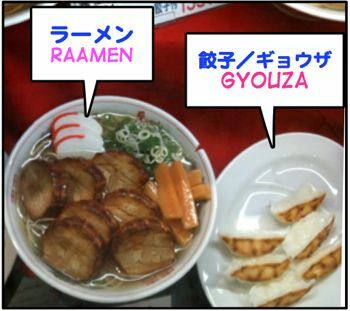 So, one of famous Nagoya’s ご当地グルメ ( = goutouchi gurume) is 天むす ( = tenmusu), rice balls which have shrimp tempura inside. Now, Japan is a small country but every region has a different type of food. 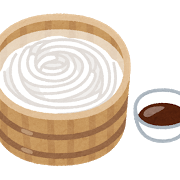 Local food is called 郷土料理 ( = kyoudo ryouri). 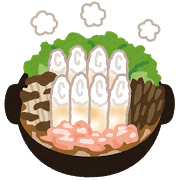 •秋田 ( = Akita) ：切りたんぽ ( = Kiritanpo) Nabe with vegetable and rice bar. 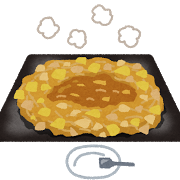 •大阪 ( = Osaka) ：*お好み焼き ( = Okonomi yaki) So-called Japanese pizza on Teppan(=iron plate). 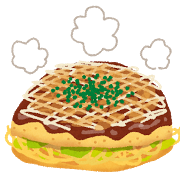 •広島 ( = Hiroshima) ：*広島焼き ( = Hiroshima yaki) Similar to Okonomiyaki but it is very thick and has noodles in it. 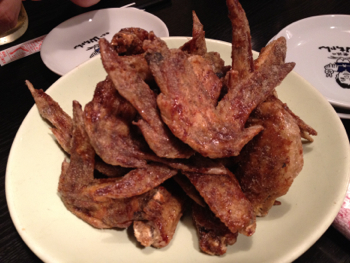 郷土料理 ( = kyoudo ryouri) local dishes, are not necessarily cheap. Some of them are expensive. But if they are cheap and eaten in casual settings, (I marked with *), we call them ご当地B級グルメ ( = gotouchi bii kyuu gurume). As I mentioned above, it is a relatively new term. But if you search with B級グルメ ( = bii kyuu gurume) or ご当地B級グルメ ( = gotouchi bii kyuu gurume) on the internet, you will get tons of hits. 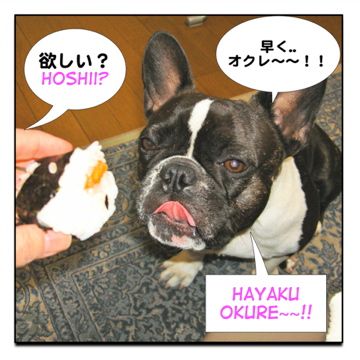 There is always a long list of B級グル メ(= biikyuu gurume) in guide books for Hawaii, such as スパムむすび(=Supamu musubi) rice ball with Spam, ロコモコ(=Roco moko) Loco Moco, etc. So if you have a chance to visit Japan, don’t just go to expensive restaurants or fast food restaurants. Be sure to try lots of ご当地B級グルメ ( = gotouchi bii kyuu gurume)!! Ex. これが欲しいです。( = Kore ga hoshii desu.) I want this. •早く ( = hayaku) hurry up! Now! 〜しておくれ ( = shite okure) imperative form “Do ~! “ Kind of old fashioned way to ask a favor which is used by especially aged people. It sounds somehow humorous. →more formal 許して下さい。( =Yurushite kudasai.) Please forgive me. = Minna no kuni nimo oishii bii kyuu gurume ga attara oshietene. = Do you have any “B-kyu-gourmet” in your countries? What are they? ah so ばかり means always? Right 鼻が出る uses the same kanji. = Ima tabeta bakari da. = I just ate now. = N.Y niwa itta bakari desu. = I just went to N.Y.
= Maggie wa itsumo benkyou bakari shiteiru. = Kare wa Aki ni bakari yasashii. = He is sweet only to Aki. Great! I love people who are willing try different food! Oh I love tacos and enchilada…Fried cheese sticks & balls?? Yummy! I’d love to try them! Yes! I have been to the US many times. やさしい！How sweet!! I have never been there. Will be super fun to see in you in person someday! !ochame!